Many companies take a serious look at central production. The prospect of better consistency and the opportunity to run larger batches lure too many of these companies into a trap. Recently, I observed the final meetings for a single unit operator expanding to a new commissary with capacity to handle production for 5 additional units. The owner wanted a new control system to handle the increased demands of his expanding business. Unfortunately, it was far too late to offer my views on commissary construction. The long term lease was signed, construction was nearing completion and heavy equipment installations were in progress. The new commissary opened and the organization is bleeding red on the bottom line. With the commissary draining funds each month, the chance of starting any of the new units is remote. Break even sales volume seems out of reach despite strong growth. So what went wrong? This was a successful single unit operator enjoying better than average unit volume for the region and decent sales growth. The strategy here is flawed. Creating the capacity to handle production for 6 units with only one unit operational is suicide. The new monthly fixed costs are too high, production workers spend too much time walking around the mammoth kitchen. Freezers and walkins designed to handle five times the current volume have raised the monthly utility bills. The fleet of vans has increased to handle movement between locations. Sales barely cover the fixed costs and wages. Rather than wasting the owner's precious time (he works 16 hour days - 7 days a week), I told him he needs to focus on volume rather than food cost control. His sales are too far below break even to worry about incremental food cost improvement. I'll be working with a different company in the same region. They just opened a new unit in this hot growth area. Sales are double their average unit volume and the operators are feeling the strain. Fortunately, profits and cash flow are robust. Manufacturing companies often segregate their parts inventories into A, B and C groups. The parts in Group A are used in high volume and are expensive. Group B has two types of parts. The high volume, less costly parts would fall into the B group. Also, expensive parts used in lower volume would be in Group B. Finally, Group C parts would include the largest number of members. These parts are inexpensive and used in low volume. Why stop with only three letters? I'd recommend segments for product shelf life and I wouldn't use Group B for two profiles. Let's use Group A to include highly perishable, costly, high volume items. If a costly, high volume item is purchased frozen, we'll use group B. Group C will include all costly, high volume items which are shelf stable. Following this approach, we'd use groups D, E and F to handle moderate volume items. The perishables would be coded to Group D. Frozen would fit the E profile and the shelf stable would go to Group F.
Since the 80/20 principle is in play in most kitchens, you'll be left with lots of items in groups G, H and I. Use the perishable/frozen/shelf stable structure to complete the grouping exercise. A 1,000 item inventory will contain about 200 items in the first three groups. The next three groups will have from 150 to 200 items. All the other items will fall into the last three groups. You'll find very few items in Group C vs. Group I. Perhaps coffee and oils will be in the C group and the spices down in Group I. When you are finished with this exercise, start to spend more time and energy with the first 5 groups. The last four groups will have the majority of items and the least amount of opportunity to favorably impact your food cost percentage. Back in 1992, New York City hosted the Democratic Party Convention. Many of the restaurants offered a special menu for $19.92 to the conventioneers. 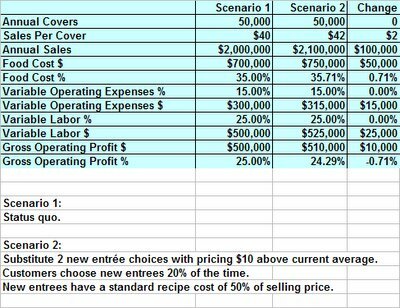 I worked with several chefs to create profitable menus given the $19.92 constraint. This exercise helped these chefs to continue offering full meal options well after the convention ended. The best place to begin a value menu is with your most popular entrees. Any menu revision impacts the popular items more than the less popular choices. Rather than taking guests in a different entree direction, allow them to enjoy a more complete meal. Every operator should know the profile of menu choices per cover. This profile includes the percentage of covers choosing a starter, entree, dessert and coffee course. If you enjoy a large percentage on starters and desserts, you may wish to avoid offering the table d'hote option. Most table d'hote menu authors include a dessert and coffee course. The dessert options include 2 or 3 low cost items. These items are frequently offered at cost - 100% - to the guest. It's important to properly cost the dessert and coffee course. The entree course often includes a slightly smaller portion size for the center of the plate choice. Since the diner will have a starter course, the smaller entree portion size will suffice. Try to develop a starter course with a cost equal to the savings on the center of the plate portion. For example, a well trimmed filet mignon steak may cost $1.00 to $1.50 per ounce. If you reduce the portion from 8 ounces to 6 ounces, you'll have $2.00 to $3.00 with which to create the starter course. Include the same vegetable, starch and bread courses as the base menu. To cost the table d'hote meal you'll start with the entree price on the menu. To this number, add the price of the lowest starter course on your menu. Finally, add the cost of the dessert and coffee option (try to keep below $2). If you charge $25 for the entree and your low cost starter is $5, the table d'hote may be offered for $32. The additional 28% rise in revenue over the entree will produce a very good food cost percentage. The cost of the starter is covered by the decrease in entree size. We have included enough revenue to cover the cost of the dessert and coffee. You're a winner if the overall check average increases. Track this statistic by day of the week to fine tune the table d'hote strategy. In lieu of cutting menu item prices, many companies decide to bundle several popular menu items into a value meal. When I lived in Montreal, we often ordered the table d'hote option at dinner restaurants. These prix fixe dinners typically included a soup or appetizer, an entree with vegetables, dessert and coffee. If ordered separately, the total price of these menu items would be higher than the house's suggested meal. Customers may actually spend more money on the table d'hote option. Most people do not order four or five courses during their restaurant visits. By enticing these customers to order a full dinner at the reduced price, the savvy manager may exert an upward pressure on the check average. If you can change the dynamic and increase customer spending through a perceived value meal, higher revenue and increased cost control may be the result. Prix fixe options are typically limited. Restaurant managers select the table d'hote options carefully each day. In addition to attracting more dollars from current clientele, new customers may try your restaurant. The QSR segment offers both value meals and value menus. Value menu boards are loaded with many low cost selections which may be combined to create a meal. Their value meals are constructed around a larger beverage and an extra item (usually fries). Value meals have a set price. The value menu board options may be ordered in any number the customer desires. I like their value meal strategy far more than the value menu boards. You can work hard to construct attractive and profitable table d'hote meal options. Your check average and food cost will be more predictable and stable. The people who produce variance reports for the weekly and monthly management meetings need to forecast the likely meeting discussion for each red flag item. Common excuses occur over and over and it's necessary to anticipate and eliminate these distractions. The only way for a food and beverage professional to have a positive impact on the results is through proper focus. Find the real problems ahead of time and structure your handouts (or overhead presentation)to highlight the major issues. Everything else is simply an exercise in excusing poor results. When the acceptance of these anecdotal responses is chronic, the operation will lose control and wide fluctuations in monthly numbers will ensue. Hopefully, a review of the common excuses will help you prepare for the next meeting and the tide will turn. At the very top of my list is the inaccurate inventory extension. Since you should have complete control over this number, avoid making bad numbers "the reason" and take the extra time to double check all very small and very large extended values. There shouldn't be any spice, flour, pasta or rice valued in the thousands of dollars. Lobster tails shouldn't be valued for pennies. Make a second copy of your Excel file and sort the list in both ascending and descending order. See what comes to the top and ask if it makes sense. Cutoff issues are always near the top of the list and the actual inventory count should be taken without deliveries. Check your drawers thoroughly and look under the desk for missing invoices. If you keep a receiving log (highly recommended), use the log to make sure you have every delivery included in the proper accounting period. Check with accounts payable for a copy of the latest statement and see if the credits are reported in the proper period. 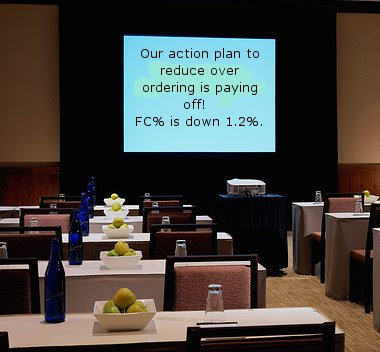 Try to completely eliminate accounting adjustments from the management meeting discussions. It is a distraction and credibility quickly disappears when the numbers don't follow the matching principle. The operators will have front line experiences which should be the real focus of the meeting and it's important to be prepared to support these topics. Let's say you have a major unfavorable usage number for beef tenderloin. Do your own investigation on customer returns and possible menu specials(POS system data). Check waste reports if you maintain these records. Subtract the waste from the total variance to determine the net amount (variance NOT explained by waste). Try to get to the heart of the variance. There will always be steaks returned by customers due to miscommunication of their cooking preference. Excessive waste and customer returns must be documented and the problems must be solved fast. Production staff will give better explanations if the topic is presented in a straight forward manner. Imagine the meeting dynamics. It's possible for certain issues to be assigned too much weight. If the waste and returns are minor, report the total variance and show a separate line for the waste and returns. Calculate the net variance and open the discussion with this figure. You may find the real problem involves meat which did not meet specification. Portion control may be lax. There is always a risk of theft. Listen for other explanations and you'll get closer to the true variance issue. Before your meetings, go back to your recipe model and look for recipes which call the top variance items. Follow the recipe path backwards if there is butchering or trimming involved. Ask yourself if the actual usage is a better figure than the ideal usage. My tenderloin example was chosen specifically for this angle. 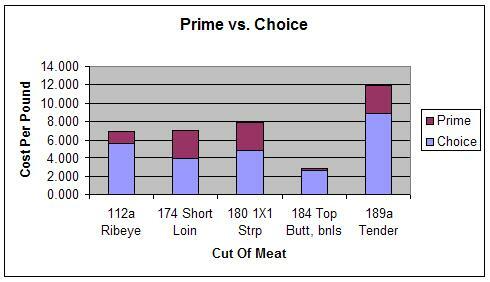 An untrimmed tenderloin will lose close to 50% of it's weight when being prepared for steaks. If you don't have a butcher yield sheet for the item, print one for the meeting and make it an action plan item. Once you are in the meeting, get the variance analysis focused by introducing each item thoroughly before the discussion begins. Your credibility will increase as you move beyond traditional distractions involving inaccurate extensions and cutoff problems. Supply everyone with your preliminary analysis and highlight the net variance. As the management team begins to take you seriously, they will come better prepared and some genuine progress will be the result. There are certain items which must be stored more carefully in order to hit your cost targets. Highly perishable items are the top priority. With most vendors running daily deliveries (despite rising gas prices), the quantity of highly perishable goods should be minimized. Schedule the purchases carefully and avoid excessive buys. Spoilage of highly perishable items should be kept to an absolute minimum. Make sure the coolers are well organized and always rotate stock after a delivery. Store items with a high risk of theft in very visible locations. Too often, I see small, high cost portions of premium meats and seafood left in storage areas far from management's view. Certain operations stock 5 ounce tenderloin portions and jumbo shrimp in storage areas well away from the office. It's much better to move these items close to your field of vision. If you like video surveillance systems, make sure one of the cameras is pointed at the location used to store high risk items. If you use pull sheets, keep the sheets for these coolers in your office and in plain view. You should know how many portions are available for sale to customers at the start of each shift. On a rotation basis, you should subtract the meal period POS menu item counts from the opening quantity and check the inventory. At a minimum, count these high risk items daily. Make your freezers easy to count. Keep everything in the exact same location at all times. Messy freezers are a problem which should be solved ASAP. If items are improperly stored in the frigid environment, it's very likely you will order more when they are in stock. Once the staff see the new delivery, theft is easier and unlikely to be detected. Walkin coolers should follow the same rules as the freezer. If you need some space for rotation of special items, try to set aside a separate cooler or a defined section of your larger cooler. Most items should be stored in the exact same location at all times. Orderly freezers and coolers make ordering more efficient and help prevent unwanted losses due to theft and spoilage. Finally, dry storage areas are typically the best maintained of all inventory locations. Make sure super expensive items like saffron and truffle oil is in a place where theft is completely impossible. Keep the storage rooms dry and cool and watch expiration dates. Try to reorder dry items using a par stock system. Determining par levels may be difficult for event caterers but most operations should find two or three par levels sufficient. For busy periods, build the stock to the high par level. Drop the par when business is slow. Maintain the status quo at other times. From time to time, certain issues surface when recipe standards are effected by seasonal shifts. The common high impact issue concerns produce yield and price as seasons change. For example, the Romaine lettuce you purchase in the off season may not only cost more. The yield will be far less than peak season. Often you will see a case price double and the yield decline. These times of high priced, low yield purchases should trigger a menu shift. In winter, I'd recommend as the special each night a wonderful soup made from seasonal root vegetables. Steer the customers away from the popular Caesar Salad to Minestrone. At this time, we in the Northeastern USA will see prices plummet on beautiful peppers. Menu items with roasted peppers, stuffed peppers and sauteed peppers will fully utilize the high yield, low price cases. On the other hand, this may be the absolute worst time of year to buy apples. With a few weeks to go until the apple harvest begins, current offerings are often of poor quality and from 50% to 70% above prices you can expect to pay in one month. poor yield item at the inflated price. Save your main recipe for the peak season. Now when your food cost percentage trends upward, you'll be able to quantify the impact of the limitation in your menu. Variance reports frequently identify huge differences between actual item usage and the calculated ideal usage. There are many reasons for these major red flags. To eliminate the obvious, you need to review the fundamental calculation of actual usage. Recheck your counts from the two inventories. Go over the invoices for the period. Check for very small and very large quantities. Make sure you did not miss an entire invoice. Pay strict attention to invoices near a cutoff date. Anything received after the ending inventory should be excluded. Once you have adjusted your actual usage to reflect changes, take a second look at the variance. You need to switch your focus to the recipe model. If an item is butchered, trimmed, cleaned, processed or if the item increases in volume when cooked (e.g. rice, pasta, etc. ), you need to check your standard yields. Make sure you haven't entered the reciprocal figure in a subrecipe yield. The final check is in plate recipes and portion sizes. These quantities should be exact and at this phase allowances for tiny variation should be avoided. Your plate recipe model should not be soft. You need exact portion sizes to tie to POS counts. Whenever possible, line cooks should use pre-portioned items in the final production. If you finish your review and find the inventories were accurate, purchases were all in order and the recipe model is accurate, you have an operational problem. There are certain problems which persist in our industry. Employee consumption of food and beverage items has a bigger impact in slow periods. During the off-season or slow days of the week, employee meal cost will be higher as a percentage of sales. Adjust your expectations to this reality and move on to much greater concerns. Collusion with vendor delivery staff is the first possible problem. You need to only pay for food actually received. Make sure receiving controls are rock solid. Limit your testing to invoices with large variance items. Problems may occur on certain shifts or on a specific day of the week. Check each invoice for the delivery person and your receiving person. Look for patterns. Chronic, unintentional food overuse needs to be identified and halted. Training will correct future overuse. Portions of salads, starches (including french fries), garnishes, soups, sauces and all other discretionary prep items need to be clear. If the operation uses forecasts to prepare for a busy period and perishable items need to be discarded, fill out waste sheets and record the reason as bad forecast. Your storage areas should be easy to count and high cost items should be difficult to steal. Small portions of tenderloin, shrimp, lobster tails and crab may require additional controls. Pull sheets are helpful. Sheets should be completed with initials and checked by the manager each shift change. Late night and early morning are the times of greatest probability of theft. Delivery times are just as bad as the close. If you have surveillance systems in place, these periods should be highly scrutinized. We have found brazen thieves taking full cases of food to the dumpsters, trunks of their car, etc. It's best to terminate these people at once. When I first started my consulting practice, there were two excellent articles on theft. The Wall Street Journal had a survey conducted by F.W. Dodge in which they interviewed food service employees. Of the respondents, 44% admitted to theft. I went to see if there was any other sources on employee theft. I found a general psychology article (source unknown) which stated about 20% of workers are very honest and 20% of workers are very dishonest. The middle 60% tend to follow the herd. If they are working with a completely honest person, theft is minimal. However, when they work with thieves, they will often steal to the same extent as their dishonest co-worker. Over the years, I have seen major mistakes made by honest workers. One person left spare ribs unattended on a grill to check a delivery and they were inedible. Another person decided to pre-cook a huge number of rotisserie chickens for a special promotion on a low traffic day. In both cases, the employees made mistakes which were one time events. Both of my clients said nothing to the employees. They both realized their mistakes and brought them to management's attention in the first place. Keeping records on simple waste sheets encourages this honest loss activity to be quantified and archived for future period comparisons. It's difficult for me to leave the theft issue hanging and management often can't see how major theft is possible. However, over the years we have found managers with relatives in the pizza business filling a van with flour, cheese and canned tomatoes. A multi-unit chain in New York tracked a vendor delivery person who visited five of their stores trying to sell cases of shrimp as a "cash only" special. Someone lost the shrimp due to poor receiving controls. My first consulting client ever couldn't believe the long time chef was a thief until the employee admitted he stole two blocks of 16-20 shrimp a week. If you believe you have reviewed and corrected all the items mentioned above and your variances still don't make sense. Review the POS setup for all menu items which call for the variance item. Look for specials, the OPEN FOOD key and buffets. You may even find the item is wrong in the system. Some companies allow managers to overwrite the menu item names on the POS. I'm not a fan of this method. The entire history is ruined with one small change. If the operation has no issues at all, check the recipe. Maybe it really isn't correct. Sometimes the wizards make mistakes. Energy prices have a significant impact on the economy. High gas prices are like a tax on the citizens each tank. Budgets need to allow for high gas prices and their impact on our industry. In the mid-1980s, the price of a barrel of oil plunged to $5. Our clientele were put under enormous cost constraints as construction and oil exploration came to a halt. The chief operating officer in our company made a tour of the globe carrying copies of an internal memo from the largest industrial contractor. The short memo stressed cost containment at all levels and made many specific instructions including the reuse of paper clips. We immediately changed our corporate travel and entertainment policy, created a request system for office supplies and called all contractors to renegotiate service levels. Our clients requested meetings with our contract team and we worked on change orders which guaranteed coverage of fixed costs and reduced the number of onsite managers required by contract. Our parent company was moving away from a reliance on remote site feeding through acquisition. We started looking for acquisition targets with contracts in urban areas. During this period, I studied zero based budgeting and constructed decision packages for each department and for each acquisition target. We were able to grow sales and profits by milking the remote site feeding cash cow and investing in less volatile urban companies. Today, the level of activity in oil exploration is back near the peak and the Edmonton Oilers were in the 2006 Stanley Cup series. I heard a Fort McMurray Today broadcast on public radio and the person being interviewed mentioned a mean salary of $90,000 for the city. I'm sure there are articles about Edmonton's population doubling in the next five years as there were back in 1982. Back in 1975, my college friends and I went on spring break to Florida. We needed to sit all night in Savannah to get gas since the stations had no gas until the morning delivery. It took about ten years to go from the gas embargoes to the huge drop in oil prices. During this period, oil production began on Prudhoe Bay, Colorado oil shale mines were developed in Parachute, major offshore drilling took place in Alaska, Scotland, Norway and Newfoundland. The current run in oil prices began during the final year of the Clinton presidency and has now entered the seventh year. In 1982, there were predictions of $100 per barrel oil (vs. $35) and today we hear many dire predictions. Meantime, China is developing strict policies on energy use and America is promoting ethanol usage. Hopefully, in three more years (or less) we'll have more memos floating around demanding reuse of paper clips at the major construction companies. In a previous post, Market Segmentation - Best Practices , I reviewed the best practices from seven segments. Each of these segments has a different strategic focus and the differences impact their long range plans. Hotels plan for occupancy levels, REVPAR, banquet event orders and conventions. These operators forecast sales and expenses by departments. In a smaller property, there may be a single kitchen with one or two bars and several banquet rooms. Larger properties have multiple kitchens and many concepts. These huge hotels and resorts often book very large events. They typically have a flexible floor plan for the affairs and book many events simultaneously. The food and beverage team takes a critical view at each meal period, event, buffet and room service. Plans include departmental level figures for food and beverage revenue, production labor, service labor, banquet labor, bar labor, etc. In addition, all other operating expenses are budgeted by department. Monthly reports compare the actual results to these budget numbers for each operation. The restaurant wizards take a look at previous year's statistics and focus on covers per meal period, check averages, turns, menu price increases, raw ingredient fluctuations and waitstaff productivity. They use this data to forecast the year ahead. Plans consider old competitors as well as fresh concepts in the market. Pricing strategy depends on profit targets and competitive pressures. 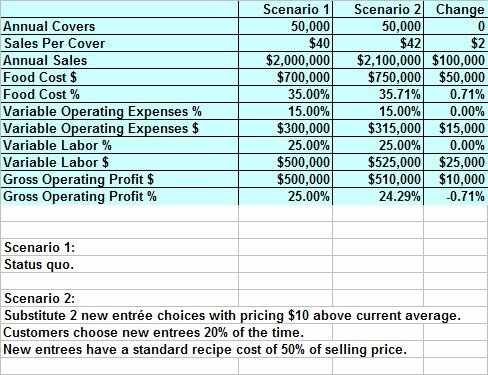 From the comparison of menu prices before and after a factor may be applied to the check averages. Covers per period, turns and any change in the number of seats provide the volume data. 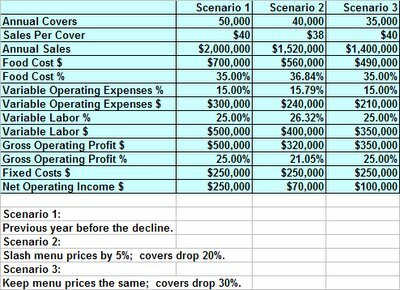 For each meal period, a sales forecast is put together using the estimated check averages and the forecast of covers. These figures are summarized by week, month and quarter and become the focus of the budget. Clubs analyze a la carte menus much like a restaurant with a large percentage of sales from regulars. They analyze similar meal period and check average data. Often, banquets and buffets represent a higher percentage of sales than a restaurant. The banquets and buffets are forecasted from a study of previous year's data (often more than one year is examined). Operators forecast start dates and end dates for seasonal clubs and weather may help or hurt them in attaining budget goals. Provision for staffing is required for the main season and the off-season. Food and beverage revenue and expenses is put in perspective with the members goals. Some clubs seek a break even result from F&B and others expect a small loss. The best F&B operations at major clubs make a positive contribution. Onsite feeders run a decaying operation along side a growing operation. Since most contracts have a definite termination date, management takes a looks at contract due to expire in the year ahead. Some contracts end when a construction project is completed. If the contract will be renewed in a competitive bid, a probability of success is assigned to the project. Knowledge of the competititor's contract expirations is also critical. Similarly, an estimated probability of taking over each account from the competition is calculated. The marketing department provides details on new business targets and their estimated probability of success. Each project is defined as hard dollar (profit or loss depends on actual results) or cost plus (all expenses paid plus a fee for management). Total volume affects the amount of overhead required. 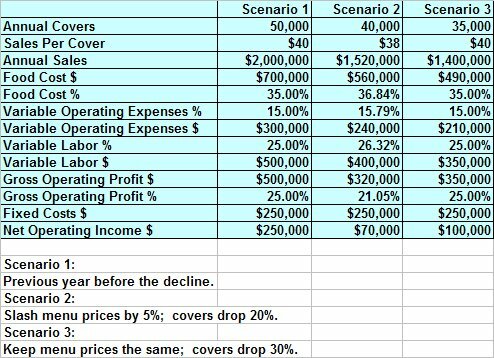 Cost plus jobs are less risky at the operational level but the documentation of job costs is higher than a hard dollar account. 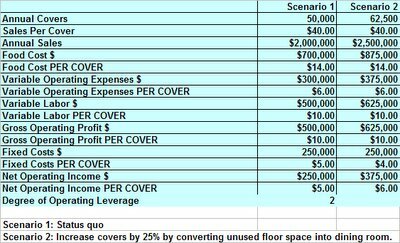 Institutional caterers break down costs into many categories since the projected margins are slim in relation to revenue. The return on equity is typically much higher than a hotel or restaurant since these operators invest very little in the bricks and mortar. The markets I have worked with treat the prepared food section like a restaurant although the top managers use market terminology (for example shrinkage includes normal trim in many markets). Projections are made for each menu category with salad bar, roasters, sandwiches, pizza, prepared entrees, sushi, hot buffets, and bakery fairly typical of a large market. Some markets now allow guests to sit down and consume the meal on the premise and alcoholic beverages may be possible. Service is typically self-serve with trays. The long term plans reflect the size and scope of the operation. Larger markets prepare figures similar to a food court with a single owner. Projections are calculated for each category but the entire operation usually has only one kitchen with a production staff capable of preparing any food item. Banquet event order systems house data banks for the previous year and the events already booked for the future year. Event caterers look at each month or season and visualize the year ahead. If the system has too few events in a normally busy month, they will put more sales and promotion assets to work. Letting a night go dark in a busy period is something they want to avoid. Focusing on each event as a separate job allows a complex budgeted income statement for all events. These estimates are placed side-by side with the actual figures as the year proceeds. Many event caterers segregate purchases by event. Careful control is exercised over each detail. Alcohol may be served in a cash bar or open bar format. This is determined for each event and estimates for the bar charge need to be made if the agreement is for a fixed beverage cost per patron. Race tracks are large complexes with lots of space for guests to roam and many ways to offer food and beverage. Most tracks offer one or more formal dining areas with wait service. Buffets are offered in many tracks since customers are in a hurry to return to the action. Throughout the entire complex, numerous bars and food outlets serve a variety of menu items in a QSR type environment. Each kiosk is tracked separately and forecasts are required for these stands. The person in charge of the stand prepares a sheet and accounts for the beginning inventory minus ending inventory with a cash projection and reasons for shortages. Long range plans account for the projected losses due to theft and poor forecasts. Operators try to limit these losses. 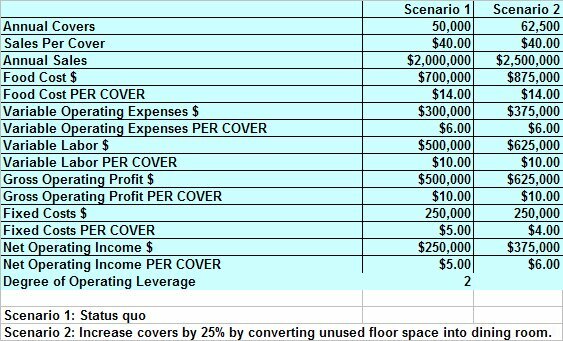 The long range plans must account for marketing costs, leasehold improvements amortization, rents, mortgage expenses, equipment rentals, depreciation, fleet maintenance, etc. At the heart of each operation, the food and beverage team need to accurately forecast demand. This demand may take the form of special events, rooms occupied, nightly covers, hot dogs per stand times the stand count, REVPAR F&B component, contracts retained, etc. The secret to success in each highly specialized segment is knowing the marketplace. Customer knowledge, competitor intelligence, major events and the weather may have a major impact on the operation from year to year. Today, I witnessed a 1 in 10,000 event. I went to my local barber for a haircut and the place was empty when I arrived. Shortly after I sat in the chair, a young man with red hair entered and sat down in a seat near the door. Just before my haircut was completed, a mother arrived with twin red heads and they were dispatched to two other chairs. Since I am also a natural red head (now faded to strawberry blond), the four of us were the only clients at 2:30 PM. I've been told the probability of being a redhead in the USA is approximately 10%. Taking .1 to the 4th power, you have a 1 in 10,000 event. Four redheads being the only clients at a single time is rare. You should always carry adequate insurance protection and budget the cost in your five year plans. Unusual events do occur. Any respectable five year plan needs to take a hard look at both the known competitive threats and the possible threats which are not yet obvious. You should start with your main competition. Analyze their current strategies and estimate the impact on revenues in year one. Try to anticipate the outcome and develop a strategic plan for counter-attack. Porter's five competitive forces is an excellent tool for analyzing competitive forces. If you have ever taken a shot at linking your entire POS item listing to recipes, the effort is significant and hopefully the return will match. The typical recipe model will include a lot of educated guesswork. Perhaps 5% subtracted from the perfect yield to allow for normal variance. When guessing the count for a typical box of 16-20 shrimp, most people use the low number - 16. If it's actually 20, that's a 20% difference. Dry goods may settle and when called in recipes by volume, yields can be less than expected. Some models adjust to the conservative side. People want variances to be caused by actions or activities other than normal yield variation. Most people set standard yields to the low side of normal. Let's introduce a brazen thief into the formula. Our thief is taking a case of frozen meat to the garbage bin about 20 minutes before closing each night. In our example, it's a high volume operation and the menu is dominated with ribs. Half racks and full racks are sold with a variety of sides and combo choices. The ideal usage calls for 100 cases of ribs a week. The thief works 4 nights a week. Would your recipe model catch the 4% variance due to theft? Portion control helps. A case of 30# baby back ribs will include 24-1.25# racks. Daily counts of prep, preliminary cooking and POS sales will help answer the 4% riddle. You won't have time to do this analysis with each ingredient. Pick your top 10 to start. It can get addictive when you see the savings. I'd limit this daily activity to 25 items.